War Grave Register notes: BRUCE, Tpr. Charlie John, 592. 9th Australian Light Horse. 5th Aug., 1916. Age 20. Son of Alfred William and Rebecca Mary Bruce. Native of Hodgkinson, Victoria, Australia. 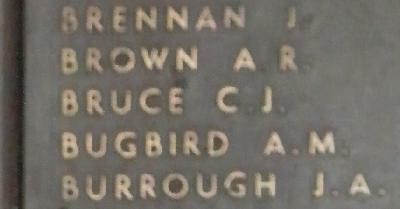 Family/military connections Brothers: Francis BRUCE, died in camp, Qld; 6800 Cpl Alfred John BRUCE, 1st Bn, Mentioned in Despatches, returned to Australia.